Obituary for Rachel A. 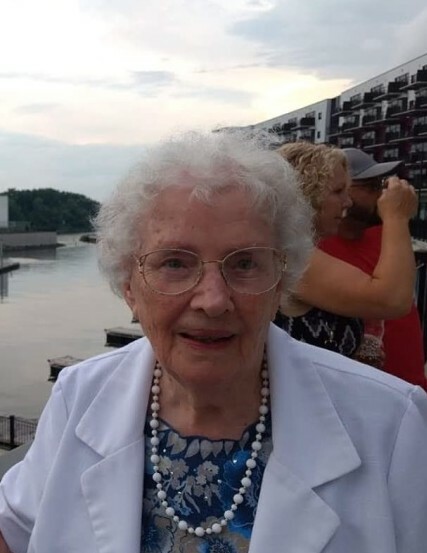 (Hickok) Phillips | DeMarco-Stone Funeral Home Inc.
Rachel A. Phillips, 95 of Glenville, passed peacefully at her home on Wednesday, February 13, 2019. Born in Ballston Spa, Rachel was a graduate of Draper High School in Rotterdam and later received her bachelor’s degree from Ellis School of Nursing. Rachel was a longtime member of East Glenville Community Church, She served as a Sunday school teacher for many years and was also a volunteer at Vacation Bible School. She was predeceased by her beloved husband, Charles L. Phillips, who died in 1999, her son John, parents Robert and Nellie Williams Hickok and 3 siblings. Rachel is survived by her children, Kathy Liska, Michael (Elizabeth) Phillips, Philip (Dennis) Phillips, Karen (Kirk) Moeller and David(Cindy) Phillips, 7 grandchildren, 12 great grandchildren and 2 great great grandchildren. Calling hours will be held on Saturday from 10 am to 12 noon at the DeMarco-Stone Funeral Home, 1605 Helderberg Ave.
Funeral services will begin at the funeral home at 12 noon.